Salsa. Jazz. Hip-hop. Imagine all these genres of music returning to the heart of Africa. Fela Kuti – musician, activist and pan-African – was the man who brought this special fusion together as Afrobeat. A unique genre, Afrobeat found its roots in Kuti’s rebellious nature – on a political and personal level. Born to an upper-middle class family in Nigeria, Kuti’s parents sent him to London in 1958 to study medicine. True to his nature, soon after his arrival he decided to study classical music instead at the Trinity College of Music, mastering several instruments in the process. After his education in England, Kuti returned back to Nigeria and started making music. However, he realised that he had returned to a culture where people associate music and dancing so closely that in order to be a successful musician, songs needed to have the type of rhythm that listeners could dance to, which is the case in most African countries. Kuti reformed a band he had created in London called Koola Lobitos and started experimenting with a fusion of Jazz and African music, especially highlife (a cross between rock and jazz influenced by traditional music from Ghana’s Akan tribe). His first few songs revolved around love and attraction. However, this all changed when he visited the US on tour with his band in the summer of 1969. There he met Sandra Smith, a member of the Black Panthers (an American political movement) who taught him a lot about the black power movement that was reaching a violent peak. This experience changed his political views along with the theme of his music. After a visit to the US in the 60s, Kuti began to share his new political outlook on the situation in Nigeria and on the rest of the African continent through his music. Kuti took calculated steps in order to accomplish this goal without compromising the quality of the songs. First, he composed instrumentals that were a unique fusion of jazz, funk and highlife. Then, in order to break down his complex philosophy and express his views without compromising the groove, he wrote and sang his lyrics in pidgin English – a form of English mixed with Nigerian slang. He also sang in the Yoruba language, which is widely spoken in Lagos, the former capital city. This choice of language was crucial in ensuring that the right people, i.e. the lower classes, understood and correctly interpreted the message in his music. Through a precise choice of language for his lyrics and a new rhythm for his intended audience, Kuti had constructed a new genre of music. This was the birth of Afrobeat. Fela Kuti became a political activist through his art. He believed good music had to be political. Criticizing the post-colonial regimes in Nigeria and other countries made him an instant hero among Africans. For example, in the song titled ‘Zombie’ he compares the Nigerian soldiers to zombies with no actual mind of their own. In another song called ‘Gentleman’, he criticizes the gentleman: a representation of the elite and how they traded their traditional African values for status. Kuti had made political commentary danceable and the lyrics relatable. He was beaten up, arrested, and jailed several times by the military regime at the time for his criticism, although this didn’t stop Kuti from making music. 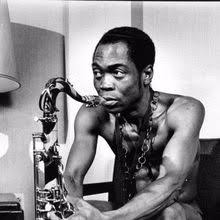 On August 2, 1997, Fela Kuti died of Kaposi’s Sarcoma, a complication related to AIDS. More than one million Nigerians attended his funeral. 1. “Fela Kuti.” Fela Kuti, felakuti.bandcamp.com/. 2. Pixel. Felabration Budapest 2018 / Trafó, trafo.hu/en-US/felabration_budapest_2018. 3. Britannica, The Editors of Encyclopaedia. “Fela Kuti.” Encyclopædia Britannica, Encyclopædia Britannica, Inc., 11 Oct. 2018, www.britannica.com/biography/Fela-Kuti.